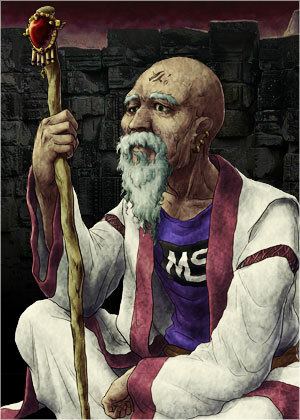 The doyen of "The Clan See and end of Starting Journey" which guards La-Mulana Ruins. Although protecting The La-Mulana Ruins according to the rule of the whole family who will continue in 5000 years or more, surprisingly broad-minded about except 'protecting La-Mulana Ruins' and incomparable high technology lover. Enjoying PC life even carring out to power generation from great water fall of outskirts of a village. Very well known as a bleeding Mr PC on the net. On the other hand, the clan's goods are abundant, though the village is in deeper place of jungle. He, acutually, is an ambitious person who is hoping to strike it rich secretly. Usually, only playing games.